$1 Off Olbas Inhalers, Pocket Size, Any Quantity! 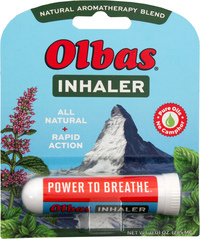 - Penn Herb Co. Ltd.
$1 Off Olbas Inhalers, Pocket Size, Any Quantity! ADD OLBAS INHALER TO CART. For more, change quantity in cart. Carry The Power To Breathe - Instantly! The fast-acting, penetrating vapors of the Olbas Inhaler provide an immediate, fresh, clean feeling in the nose, sinuses and lungs. It is especially beneficial during times of seasonal discomfort, low humidity and other unwelcome nasal encounters. And best of all, Olbas Inhaler is non-habit forming. Pop one in your pocket or purse for instant relief anywhere. Makes nasal passages feel cleaner; helps you endure seasonal discomforts; lessens effects of low humidity.